Are you wondering what the must have plugins and tools for WordPress sites are this year? Having the right set of tools on hand can help you take your WordPress site to the next level. In this article, we’ll share with you the top plugins and tools for WordPress websites in 2019. It would be silly not to mention WPForms as one of the must have WordPress plugins of 2018. After all, being able to stay in touch with your site visitors should always be a website owner’s main priority. And, as the most beginner friendly contact form for WordPress on the market today, we know that using WPForms will not only make it easy for you to stay in touch with site visitors, it will give you the flexibility to create any kind of form on your site you can think of. For example, you can create a simple contact form, allow file uploads, display a survey or poll to site visitors, or even collect donations for your nonprofit organization using WPForms. And the best part is, you don’t have to know any code to create your forms. Simply use the built-in drag & drop form builder. From there, you can jumpstart your email marketing efforts, start collecting payments for goods and services, and even hire for open positions in your company using the job application form template. OptinMonster is the most powerful lead generation software you can get your hands on today. It helps you grow your email list by giving you the tools needed to create beautiful forms that are proven to convert. In addition, it comes with highly advanced targeting and segmentation features that let you show the right content to the right people at the right time. All of which helps you increase site visitors engagement, boost conversions, and generate more sales. Not to mention, you can easily conduct A/B tests and view analytics that matter to the growth and success of your business, without using any other solutions. Check out these compelling case studies and see how OptinMonster has helped others build their business and become more successful than ever. MonsterInsights is the best, and only, Google Analytics plugin for WordPress today. It lets you easily connect your Google Analytics account to WordPress so you can start learning about your site visitors right away. For instance, find out what kind of people are coming to your website, where they’re coming from, and what they’re doing once they land on your site. As an easy to use WordPress plugin, see all your site’s most important data in one convenient place, all from your WordPress dashboard. Not to mention, you can track your WPForms forms using the MonsterInsights Forms Addon. See things like form views, submissions, and conversions so you always know what’s working, and what’s not. This of course is in addition to standout features like Google Optimize, enhanced link attribution, ads tracking, and Google AMP. There’s nothing worse than finding out that your entire website, and all its data, has disappeared. That’s why when it comes to website security, we know that having a reliable backup system is one of the most important components. With BackupBuddy, saving your site’s data, and restoring it if need be, is super simple. You can schedule automatic backups of your WordPress site, store your backups in a secure, off-site location, and receive immediate email notifications any time BackupBuddy needs your attention to preserve your hard work. Constant Contact happens to be one of the best email marketing service providers around. It helps you build your email list, manage subscribers, and automatically handles daily tasks like unsubscribes for you. It works with lead generation software like OptinMonster and integrates seamlessly with WPForms. In fact, you can add a Constant Contact checkbox to every WPForms contact form on your website so people that are getting in touch with you can easily sign up for your email list. Optimizing your WordPress site for SEO is crucial to your success. After all, if you don’t appear on the first page of Google when people search for things related to your website, chances are low that a lot of organic traffic will come your way. Luckily with Yoast SEO, you can manage your content’s SEO from the WordPress dashboard. Aim for a green light when it comes to written content, check out how your search results snippets will look, and make sure you have a strong keyword that will resonate with people searching for things you have to offer. Site speed and performance are paramount to the user experience. If your website fails to load quickly, or doesn’t perform as it should, you can bet your site visitors will abandon your site and never return. Using Google PageSpeed Insights, you can easily enter your WordPress iste’s URL and see just how fast your web pages load. If there are any issues found to be slowing down your website, or negatively affecting its overall performance, Google will give you a list of suggestions and tell you how to fix everything that’s going wrong. And the best thing about this online tool is that it’s free to use so you can routinely check and make sure your site is up to speed. If you really want to make sure your site is optimized for SEO and the highest search ranking possible, it’s important not to forget about your site’s images. Images are one of the main culprits of slow page loading times. TinyPNG can help with that by compressing your content’s images, before uploading them to your website, without sacrificing the image’s quality. All you have to do is drag & drop the images you want to optimize, download them once compressed, and upload them to your WordPress Media Library for use. You can compress both PNGs and JPGs up to 5MB in size with this free online tool. Slack is the perfect tool for bringing your team together as one so communication is never lost on anyone. In fact, our team uses it to boost productivity, help with team management, and even allow for communication across different timezones. You can send direct messages and have one-on-one conversations, add thoughts to the channels everyone has access to, and even conduct voice and video calls, complete with screen sharing if you want. 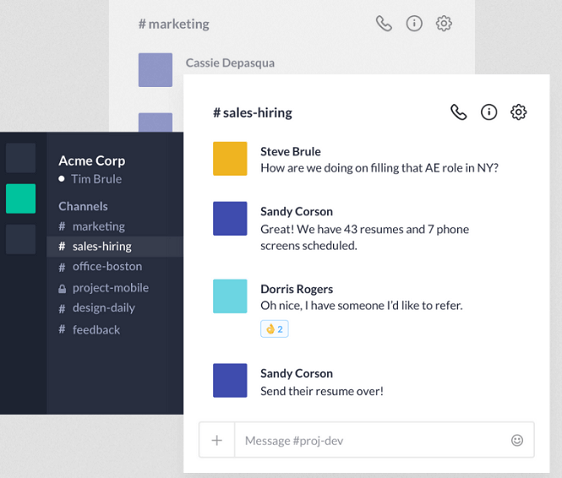 You can also view archived messages, integrate Slack with over 1000+ other apps for streamlining your workflow, and avoid lengthy email chains that get lost, mixed, up or include people that are no longer involved. If you’re looking for a way to improve your keyword research efforts, SEMRush is the perfect tool for you. To start, you can check for keyword search volumes to make sure you’re targeting the right ones for your ad campaigns. You can also get keyword variations to use in your content to make sure your site indexes in the best way possible for search results. With SEMRush, you can even monitor what your competition is up to by entering their URLs to see what keywords they rank highest for. Using this information, you’ll know where to fill in the missing pieces on your website so your own search rankings will improve and your business will continue to grow. Sucuri’s web application firewall is one of the most well-known out there. And rightfully so, seeing as they protect WordPress websites from things like website hackers, DDoS attacks, blacklist warnings, malware threats, brute force attacks, and much more. 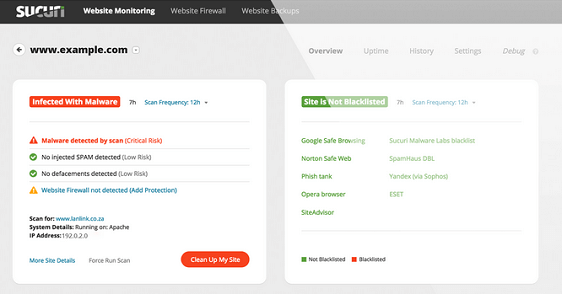 In addition, it helps optimize your site for speed and performance, has a 24/7/365 incident response team to help you whenever you need it, and continual monitoring so suspicious activity is always caught early on. Don’t let your WordPress site fall victim to malicious activity. Take a proactive approach to site security and use the Sucuri firewall so you can rest easy that your website is safe and secure. WooCommerce is one of the best and most affordable eCommerce platforms on the market today. Not to mention it’s extremely popular and easy to use. Offering a complete and professional way for you to sell physical and digital products on your WordPress website, WooCommerce makes sure the customers checking you out have a seamless buying expereince. It comes with extensive payment options, shipping features, beautiful design options, including the exclusive Storefront theme, and the ability to set up things like memberships, subscriptions, variable products, and more. And you maintain complete control so you never have to worry about a third-party owning the rights to your online shop. The faster your website loads, the higher you’ll rank in Google. This means more site visitors will come to your business, buy the things you have for sell, and subscribe to your email list. Using a caching plugin like W3 Total Cache ensures that you’ve compressed all your site’s files into a cache so they can be delivered as quickly as possible to site visitors. This reduces the load on your website’s server, makes your page loading times faster than ever, and creates an exceptional user experience that will encourage site visitors to return to your site time and time again. MaxCDN is one of the most reliable content network delivery systems out there today. It integrates easily with WordPress and aims to deliver static content to your site visitors, based on their geographic location, as quickly as possible so they stick around. Their services include instant purge, real-time analytics, and 24/7 technical support so you never have to worry when you run into an issue. In addition, it comes with built-in security features so your data is never compromised, the ability to scale as your business grows, and lets you control everything from a single dashboard. When you publish content for your site visitors to read, it’s not enough to entertain, educate, or inform them about your business. Making sure your visitors understand the content is nearly as important so they continue to engage with what you’re saying and explore more of what you have to offer. 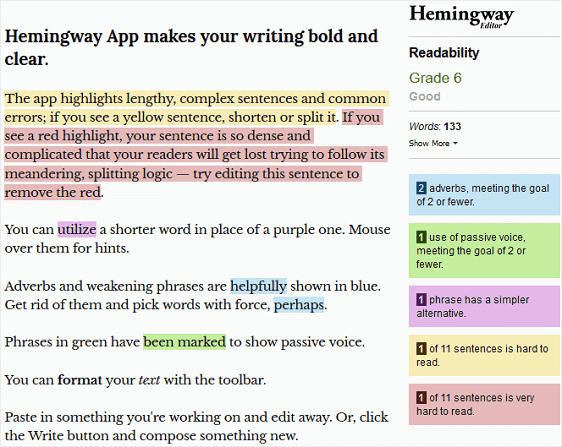 Using the Hemingway Editor to fine tune your content is one of the easiest things to do. Just copy and paste your content into the app and let the app tell you where you can improve. You’ll see highlighted sections of text that correspond with suggestions to make your content easier to read. You’ll also get a grade level to aim for so that anyone reading your content can understand it. Making your site more readable will help bots crawl and index your site better and get you higher search rankings. And you know that means more traffic, conversions, and sales. You might not know this, but broken links on your WordPress site can do a lot of damage. Not only do they encourage site visitors to click the back button and go elsewhere, they can also hurt your search engine rankings in Google. If your website has some broken link issues, use the WordPress plugin Broken Link Checker. Its super easy to use, and finds broken links in your site’s pages, posts, and comments for you. It even sends you a notification whenever is finds a broken link so you always know when something is wrong. Plus, it’ll stop search engines from caching broken links. You can test each broken link right from your dashboard and decide to edit, unlink, mark as “Not Broken,” or dismiss all broken links found on your site. Building a WordPress website doesn’t have to be hard to do, even if you’re just starting out. By using an intuitive drag & drop website building like Beaver Builder, you can create a fully customized WordPress site within minutes. Use the simple interface to create your own page layouts. And, whether you have an existing WordPress site, or are just starting out, this helpful page builder plugin will work for you. Use the pre-designed templates to get started, translate content with the popular WPML plugin, set up WordPress Multisite and customize them all, and even build a WooCommerce storefront, all without knowing a single line of code. Freshbooks is the perfect accounting software for those with WordPress sites. Invoice clients, collect payments, and manage the finances using this all-in-one billing solution. You can create customized invoices that match your brand so people always know who you are and why you’re asking them for money. In addition, accept credit cards for invoices so you don’t have to wait on checks to arrive in the mail or make multiple trips to the bank. You can also automate the systems you want, such as sending out recurring invoices to clients, request deposits upfront, and even track your time and expenses so you always get paid what you’re worth. 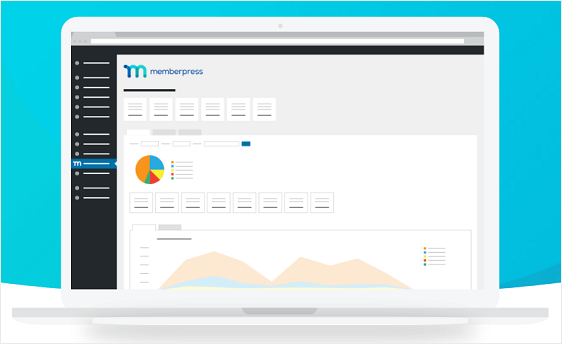 MemberPress is the best WordPress membership plugin in the market. It lets you create fully functioning membership sites that include multi-level subscriptions and content restriction, while working seamlessly with WordPress. Integrate with AWeber, Mailchimp, and Constant Contact, as well as BuddyPress so you can create a forum for members. This membership plugin integrates with both PayPal and Stripe, and has features such as coupon generation, dynamic pricing, and content dripping so you can generate the highest revenue possible. Plus, it’s super simple to setup so even beginners can create full-fledged membership sites. 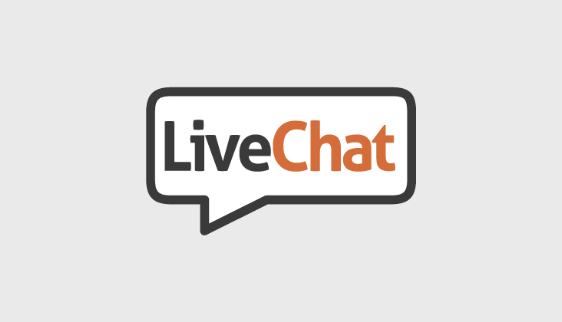 If you’re looking for a live chat software for your eCommerce website, look no further than LiveChat. It’s super easy to set up on your WordPress website and comes with plenty of built-in customization options. Plus, you can access detailed analytics and reports, even integrating it with your Google Analytics account, to make sure LiveChat is helping your grow your business. LiveChat connects seamlessly with third-party tools such as your CRM, email marketing service, and support software so you never have to worry about compatibility issues. It also loads fast so the user experience is never sacrificed when a site visitor needs assistance. 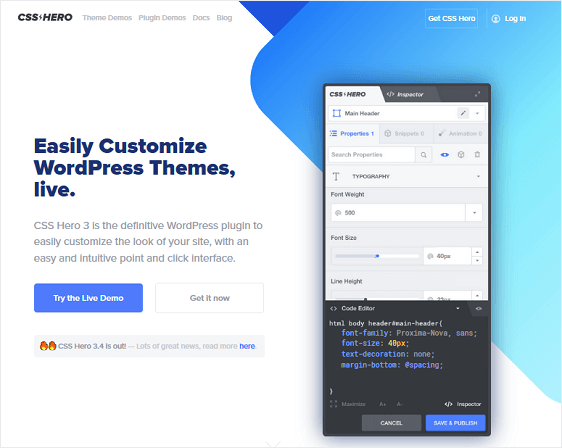 CSS Hero is a WordPress customization plugin that lets you change the design of your WordPress theme without touching a single line of code. WordPress themes use CSS for to make your website appear a certain way for site visitors. So, If you want to make custom changes, you’ll have to learn CSS. With this cool plugin, however, you can change the look of your website without having to use CSS. This not only saves you time, it helps beginners make custom changes to their website without having to learn complicated code. 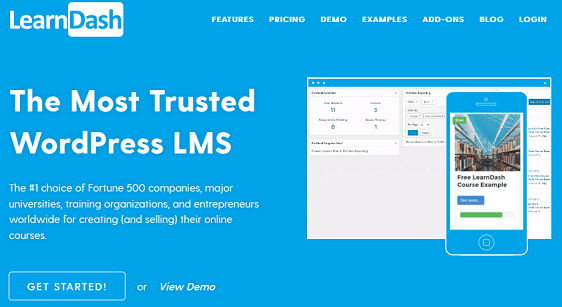 LearnDash is a WordPress LMS plugin giving website owners a way to create and sell online courses with their exclusive Course Builder tool, require students to take quizzes, and even award certificates based on a user’s progress. With this platform you can sell memberships access to your courses, allow site visitors to make one-time purchases, and even accept recurring payments for subscriptions. With over 300 payment gateways and supporting the latest technology, LearnDash makes creating online courses a cinch. Students can create front end profiles to track their progress and you can restrict content, unlocking it as people engage with your courses and finish them one by one. SeedProd is the most popular coming soon and maintenance plugin for WordPress. It offers you a great way to capture high-quality leads and start building an email list, before your site goes live. It comes with a countdown timer, social sharing capability, and referral tracking. If your website is only temporarily shut down for maintenance, you can create a stunning page that lets site visitors you’ll be up and running shortly. There are plenty of templates to choose from so designing your page is easy. Not to mention, the SeedProd real-time page builder allows you to customize your page to meet your needs. If you’re an affiliate marketer, ThirstyAffiliates is a must have plugin for your WordPress website. With it, you can organize all your affiliate links in one place on your site and add them to your content with a single click. Plus, your links will be cloaked to look short and pretty so you don’t have to use the long, ugly affiliate link given to you. Automatically replace any keyword on your website with an affiliate link so you can maximize your revenue. Plus, access detailed reports to track your affiliate marketing success, enjoy automated 404 error checks, and even integrate this plugin with your Google Analytics account so anytime someone clicks an affiliate link, data is sent there too. Revive Old Posts lets you automatically share old blog posts on your social media accounts so you can continue to drive traffic to your site. Share on Twitter, Facebook, LinkedIn, Pinterest, and Tumblr so you can reach the broadest audience possible. Include blog posts, media, and even custom post types in your social media messages, and even let Revive Old Post create hashtags to draw more interest and expand your reach. Setting up this plugin only takes a few steps and from there it does all the work for you. Don’t let old blog posts go stale, especially when they offer your target audience a lot of value. Instead, take advantage of all your hard work, no matter how long ago you did it. Having a mobile-friendly website is important for your small business. After all, nearly half of all internet traffic comes from mobile devices. Using a free online tool like Responsive Checker, you can not only find out whether you’re website is responsive, you can cross check multiple device types such as smartphones, laptops, and tablets. Just enter your site’s URL into the tool and find out whether your site is mobile-friendly. Plus, navigate your site in real time to make sure all webpages render the way you want them to for those on the go. BirchPress is a premium WordPress appointment booking plugin that helps you add online booking forms to your site. To start, embed an appointment booking form on any post or page. From there, let site visitors check available times and even book reservations. This must have WordPress plugin syncs automatically with calendars such as Google, iCal, Android, and Outlook so you always know when a new appointment has been made. Customize your booking form, send out email reminders about upcoming appointments, and accept online payments using PayPal so you know you’re paid in full before a customer shows up. If you need a way to grow your business by booking more customers, BirchPress is the right solution for you. G Suite is the type of tool all small businesses need to succeed. As a professional email hosting service from Google, G Suite lets you create and secure business emails for your website. This way you can communicate with both your team and customers without having to dig through an inbox full of subscriptions, promotions, and other emails you might receive in your personal email. G Suite offers website owners more than just powerful email. Integrate with online calendars, documents, and even enjoy video conferencing capability for added communication channels. If you’re in need of a business email, G Suite is the most professional and secure solution. And there you have it! 28 of the very best, must have plugins and tools for WordPress sites in 2019. We hope this helps you continue to grow your website’s following, email list, and sales, so you can take the next step with your business and continue to grow throughout the end of the year. If you happen to run across the Contact Form 7 plugin, and start to wonder if it’s the better option, be sure to check out this comparison of WPForms vs Contact Form 7 so you can make the best decision for yourself. And if not, ask yourself why you’re waiting. Get started with the most powerful WordPress forms plugin today and stay in touch with your site visitors starting right now. Glad that you posted this amazing list of must-have plugins for a WordPress site/blog. But I want to know that does having that much of plugins won’t affect my site’s speed? While the number of plugins installed on your site can affect its speed, you also have to take into account the complexity of the jobs these plugins are going to be doing. Plugins that are designed to do more complicated tasks are made up of more complex code so your site’s speed may be affected by this since the browser could take longer to render them. So it’s not so much about the quantity (although that does factor in) but more about the quality.